The FUNCTIONAL FOOTBALL TRAINER is a regulation size football that is filled with polyurethane foam and fitted with an eyebolt so it can be attached to a resistance machine. Gripping the ball and pulling it in various sport specific movements against resistance will increase gripping strength in a player’s fingers and hands. Standard pull down movement helps develop back and rotator cuff muscles. Use it to isolate the triceps through a push down or overhead triceps extension. Tight Ends, Wide Receivers and Running Backs can work at pulling the ball down and then tucking it away. 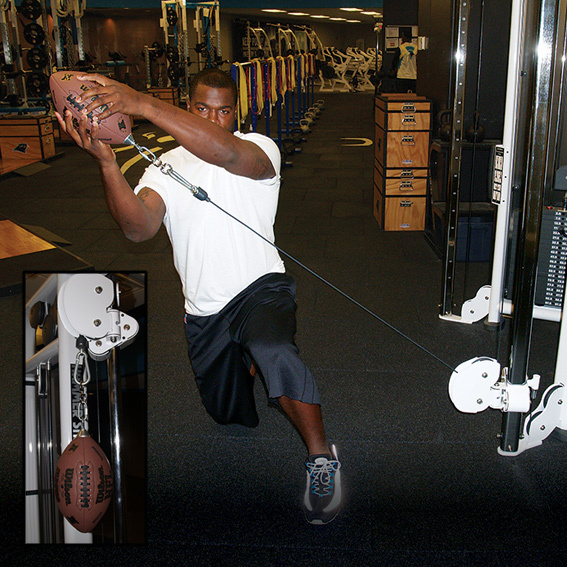 Using a tension cord tethered to the bottom of a rack, Centers and Long Snappers can pull the ball against resistance to develop a more powerful shot gun or long snap. Resistance training with a “real” football is of greater functional value versus using a medicine ball that does not mimic the exact shape and feel of a football. Available in two sizes: college and pro. "The coaching point is to develop powerful gripping strength!"